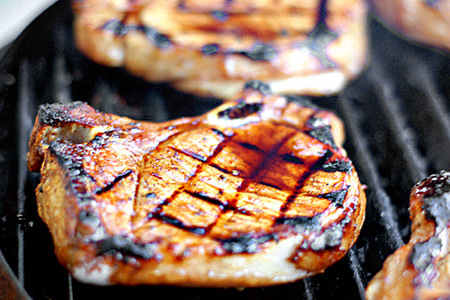 As the name indicates, this is a quick and easy way to grill some restaurant-worthy pork chops, Tuscan-style. The recipe uses very common ingredients with great results. I don't know what else to say, so let's get on it. Put the chops in a gallon-size zip-top bag, and dump in the salad dressing. Seal the bag, removing the excess air, and shake to coat the chops well. Refrigerate the chops and let them marinate 4-6 hours. Remove the chops from the bag and shake off the excess marinade. Set them aside on a platter. Pour the marinade into a small sauce pan and add the balsamic, honey, and black pepper. Bruise the rosemary by rolling it several times gently under a rolling pin. This will give you the flavor without the needles. Add the rosemary to the sauce pan and bring the mixture to a slight boil over medium heat. Boil the liquid gently for five minutes then remove from the heat. This kills any nasties that were hanging out in the marinade. Start your grill and prepare for direct grilling over medium-high heat (400-450º). Grill the chops until they readily release from the grate, about three minutes. Rotate the chops 45º and continue cooking for about two minutes. Note: These cooking times are approximate, and they are based on chops that are about 3/4" thick. Your mileage may vary. 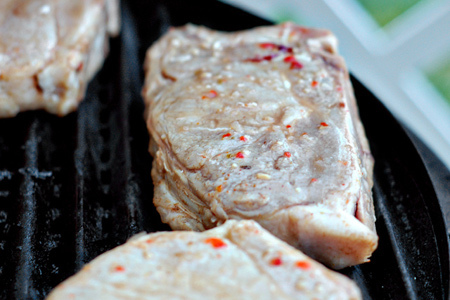 Flip the chops over and grill three minutes more. Brush the chops generously with the finishing sauce. Rotate the chops 45º and continue cooking for about two minutes more. Brush them with another good dose of the finishing sauce. Remove the chops to a platter and, brush them with the sauce again and let them rest five minutes. Serve with a good drizzle of the finishing sauce and enjoy! These look awesome! My husband thanks you! I love your blog design! I just wrote down this recipe and I can't wait to try it. 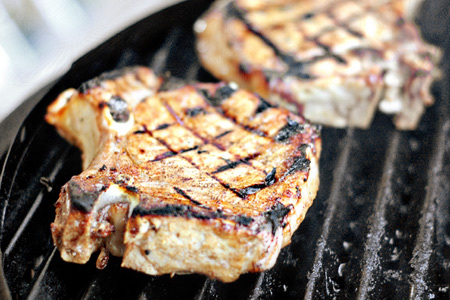 I am always looking for new ways to grill up some pork chops! Oh, one more thing, what is a good brand of balsamic vinegar? I have never purchased that before? What does it taste like? These were awesome! Thanks for sharing!